I have no tat­toos, but I love see­ing oth­ers’ tat­toos. 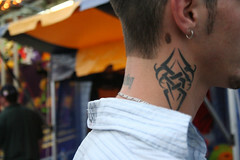 I love imag­in­ing what tat­too I might get one day if I got one. I actu­al­ly spend quite a lot of time doing just that. I know that there are many dif­fer­ent opin­ions out there on tat­toos. Some peo­ple think that tat­toos are tacky, a bad deci­sion, or a regret wait­ing to hap­pen. This post to this point has tak­en me a cou­ple hours to write. Look­ing back, I haven’t even done much writ­ing, but I end­ed up spend­ing the major­i­ty of that time look­ing at the dif­fer­ent pic­tures of tat­toos on Flickr. I guess that you might say I was sucked in. The oth­er night, I was telling Jason how much I like tat­toos and how it seems like a con­tra­dic­tion to my per­son­al­i­ty and style. I think part of the rea­son I have held off on get­ting a tat­too to this point is that I don’t want it to look fun­ny or like a mis­take on me. I also haven’t been able to think of some­thing that I like enough to put on my body for the rest of my life. I also want to wait until I’m done hav­ing kids. I would sup­pose a tat­too might not look the same after it expe­ri­ences a preg­nan­cy. In the course of that con­ver­sa­tion, Jason men­tioned that a friend of his from col­lege had a big pet peeve about peo­ple who got tat­toos that seemed to be trendy at the time. This friend of Jason’s didn’t like when peo­ple got tat­toos like Chi­nese sym­bols. He seemed to think that they hadn’t put enough thought into it or some­thing. At first, I didn’t think much of it, and then I got a lit­tle mad. Wait a minute! Tat­toos are a means of per­son­al expres­sion. I am in no place to eval­u­ate the thought process or log­ic behind some­one else’s deci­sion, nor do I want to! I know there are peo­ple who get tat­toos in the heat of the moment and have them removed lat­er. I know there are oth­ers who get tat­toos when they are in one stage of life and find that when they are in anoth­er stage the tat­too no longer rep­re­sents the same thing to them. I also know that a tat­too is a per­son­al deci­sion. I knew a woman in col­lege who had a pret­ty large tat­too of Yoda on her back. While Yoda wouldn’t have made my Top 10 List, he was also not on my body, so he didn’t have to. Peo­ple choose many dif­fer­ent ways to express them­selves from pierc­ings, tat­toos, hair dye, and cloth­ing to writ­ing, danc­ing, speak­ing, and blog­ging. It’s not up to me (or any­one else) to approve of or val­i­date these deci­sions. Per­son­al expres­sion is just that, per­son­al. Instead of using my time to judge some­one else’s choice, I will use my time to admire, learn from, and be inspired by those choic­es. Do you have a tat­too? Is there a sto­ry behind it? Do you have a pic­ture of it you would be will­ing to share? I’d love to hear the sto­ries and see the pic­tures! *I don’t know if the peo­ple in these pic­tures hold the same opin­ions on tat­toos and why peo­ple tat­too as I do. In fact, I assume that they prob­a­bly don’t hold the exact same opin­ion. I used the pic­tures because they illus­trate dif­fer­ent opin­ions that I’ve heard expressed on tat­toos over the years not to say that the sub­jects of the pic­tures agree with or hold my opin­ion. Late­ly, I’ve been notic­ing some­thing at our house. Kael is 4 years old (5 in Novem­ber), and Asa turned 3 in July. It seems to me that right now their inter­ests and abil­i­ties are prob­a­bly as dif­fer­ent as they have been in quite some time. We have def­i­nite­ly tak­en advan­tage of the fact that they are close in age when buy­ing toys, games, and oth­er play things around our place. We often buy things for them that we know they will both like and be able to use. Up until now, I think this has worked pret­ty well for us. They play togeth­er pret­ty well for the most part. They have great imag­i­na­tions and do a lot of cre­ative play and imag­i­nary play. Asa with his cape and water shoes giv­ing me the angry eyes. They have no prob­lems find­ing things to do when we are out and around town at parks or friends’ hous­es. For a while I thought maybe he wasn’t get­ting enough active play. Maybe he was too tired and need­ed more sleep. Maybe there was a diet imbal­ance or sen­si­tiv­i­ty to some­thing we were eat­ing. Then, today a friend men­tioned she and anoth­er friend had felt sim­i­lar­ly about their chil­dren who are about Kael’s age. Anoth­er obser­va­tion that my friend made was that Kael’s birth­day and Christ­mas are about six weeks apart. This means that the major­i­ty of the stuff he gets as gifts comes dur­ing this time peri­od. It also means that by this time of year, most of those things are also geared for some­one almost a year younger than he is. I feel like much of what we have to do around our apart­ment is geared for the 2–4 or 3–5 age range. I also feel like Kael is mov­ing very much into the next brack­et what­ev­er that is. Maybe 4–6 or 5–7? I am not real­ly sure since this is new ter­ri­to­ry, but I think you prob­a­bly get the idea. What do I do about this? I’m not real­ly sure. There are a few things that Jason and I have thought about and talked about. None of them seem to real­ly solve the prob­lem, so I’m guess­ing the solu­tion is more of a lit­tle of this, lit­tle of that kind of solu­tion vs. a black and white answer. We talked about get­ting Kael some new stuff. I feel like cring­ing as I even write that sen­tence. On one hand, I know that stuff (games, toys, books, etc.) is not the answer. How­ev­er, on the oth­er hand, I under­stand the val­ue of hav­ing age appro­pri­ate and chal­leng­ing oppor­tu­ni­ties avail­able for him. We talked about doing some sort of play­date exchange with a friend where one day a week, Kael would go to a friend’s house to play for a few hours. This would give him a change of scenery, some new toys to play with, and a dif­fer­ent expe­ri­ence than he would have at home. My hes­i­ta­tion with this one is that I can’t just send him to a friend once a week. I would also need to have this friend’s child over to our house for a morn­ing once a week. With the upcom­ing move and a baby on the way this seems over­whelm­ing right now. We talked (very briefly) about putting him into child­care or preschool for a few hours a week. Nei­ther of these were quite right either. We don’t need some­one to just keep him at a child­care cen­ter and watch him play. We also are not all that excit­ed about most of the options that are avail­able here. There are a cou­ple options that we are com­fort­able with as far as the phi­los­o­phy of the preschool goes, but they don’t work out for oth­er rea­sons. One costs more than we are will­ing or able to spend on a “just because” preschool. Anoth­er is just a cou­ple hours in the morn­ing and requires fair­ly fre­quent par­ent­ing par­tic­i­pa­tion. Between the short time peri­od and the required par­tic­i­pa­tion, I think it would be near­ly impos­si­ble to work out the logis­tics after Baby is born. As I read through this post, I feel like the last part is quite a bit of, here’s what we could do, but here’s why it won’t work sort of excus­es. I’m actu­al­ly a lit­tle hes­i­tant to leave it like that, because when I have a con­ver­sa­tion with some­one with that atti­tude, I usu­al­ly want to say some­thing like, “Well, I guess you’re stuck.” But, I’m going to leave it most­ly as a train of thought sort of post. So, what would you do? Have your kids ever out­grown their toys? What toys, games, activ­i­ties, sup­plies, books, etc do you rec­om­mend for an almost 5 year old? Any oth­er thoughts or ideas?